Day two started off with a guided walking tour of the Kyoto Imperial Palace, which was free but needed advanced reservations and approval from the Kyoto Imperial Household Agency. Our tour started at 10am, so we decided to head out a bit earlier and have breakfast at the Imperial Palace Gardens. The outer compound was huge, and it took us quite a while to walk up to the entrance gates. The tour was conducted in English, and it brought us around the Imperial Palace grounds. Kyoto had been the capital of Japan for over 1000 years, before moving to Tokyo in 1869. The palace was actually destroyed by fire several times but always rebuilt in the same traditional manner and in the same location. Nowadays the palace is uninhabited and serves as a museum. Roof construction details. The entire roof is made out of cypress bark, hand laid in several layers. each piece of bark is pinned into place with a bamboo pick. The cypress bark is used because it has natural water resistance, flexibility to form shapes, and insect repellent properties. The thickened part of the roof near the front is just for aesthetics and is also made of cypress bark. 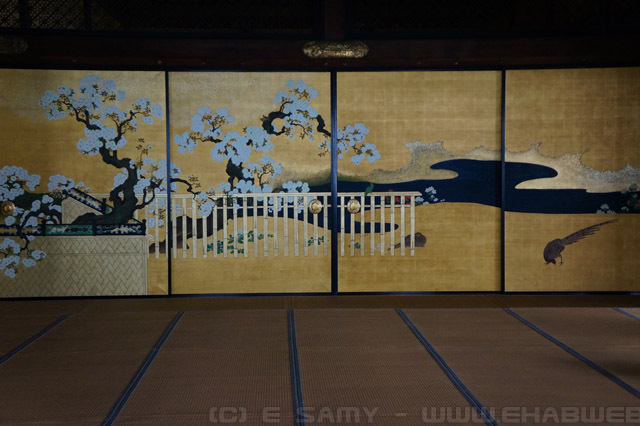 During the tour, the tour guide explained that there was a period during which Kyoto was not ruled by the emperor, but rather by the shogun, leader of the samurai. 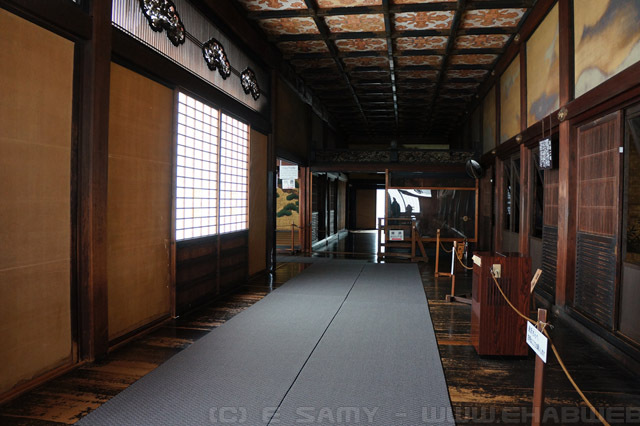 The shogun did not reside in the imperial palace, but in Nijo Castle (Nijo-jo) instead. After some time, the 15th shogun Yoshinobu publicly and peacefully restored the sovereignty to the emperor. We thought it would be interesting to see the difference between an imperial palace and a samurai castle so we headed there afterwards. Nijo-jo was in fact incredibly different than the imperial palace. It seemed to have a darker, more heavy air. While the imperial palace only had thick outer walls, Nijo-jo had a succession of moats and high, thick walls. The gardens were not as dense and manicured, but the buildings were far more decorated. What was great was that unlike the imperial palace, we could actually enter into the castle and walk through it, though photography was not allowed. 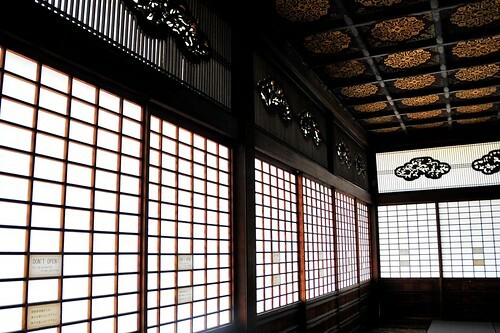 Inside the Nijo-jo compound there were actually 2 main buildings, the Ninomaru palace and the Honmaru Palace. TIL: the roof ends are actually crests indicating the family/affiliation of the inhabitants. for the Imperial Palace its a 16 petaled chrysanthemum. Inside the Ninomaru palace the ceiling and walls were painted with vivid imagery, finished off with gold paint and filled with incredible detailing. One of my favorite parts about the building was the floors. The nightingale floors as they were called were specifically designed in such a way that when stepped on, would produce a small high pitched chirping sound, which alerted the inhabitants of movement and prevented any sneak attacks in case of infiltration. After walking around the compound and gardens we decided to then go to the famed Kiyomuzudera Buddhist temple. Getting there was certainly not the easiest thing as you have to climb uphill for quite a while before reaching the temple gates. But the many shops selling souvenirs, delicacies and oddities certainly make the climb less painful. We kept on stopping every few metres to oooh and aaahhh at elegant fans, pretty purses, intricate kimonos etc. :p Once at the gate, you have to do a little bit more climbing up a few flights of stairs to get the actual temple. not sure if this was a beggar or what. The place was crowded with tourists even though we went during non-peak season. Can't imagine how thronged it would be during spring and autumn when the trees are all blossoming and full of color. from the temple we had a great view out to the entire Kyoto city and to the lush forested area where the temple was nestled. Stepping out onto the wooden stage is quite scary if you're afraid of heights, because not only is it very high up with a straight drop, but the stage also looks like it's going to fall off because its slanted slightly downwards. The entire temple was built without a single nail, and the columns system supporting the temple high off the hills was quite incredible. At the foot of the temple there were these water fountains, from which the temple derived its name. (Kiyomizudera means Temple of Pure Water) People formed a long line to get a chance to drink from one of the three fountains, each with its own supposed benefit, such as long life, success, and a fortunate love life. Walking downhill from Kiyomuzudera we tried to find our way to the preserved streets of the Higashiyama district. We got lost after missing a turn but backtracked and it was definitely worth it. The streets were so quaint! we felt like we were walking through a movie set or theme park because it seemed so pristine and so cute! doesn't it feel like a movie set/theme park? Japanese people are very into umbrellas. sold everywhere, and they're so pretty too! cute purses made of traditional fabric with traditional print. At the end of the preserved streets we found ourselves at Maruyama Park, and passed through it to get to Gion, the Geisha district. The main street in Gion is Hanami-koji, another preserved street just off the Shijo-dori shopping street, and we walked along slowly, hoping to catch a glimpse of the elusive geiko (Kyoto dialect for geisha) or maiko (Geiko apprentice) we walked alllll the way to the end of the road with no luck, and by this time our feet were screaming, so we decided to just sit down by the side of the road next to Gion corner (a sort of performance house for all the traditional Japanese performing arts including geiko dancing) and people watch, which was definitely interesting. at which point i squealed to munira "Maiko Mun! Maiko!" we were trying to keep up but gosh darnit she can walk so fast!